1. Natural disasters: U.S. gasoline futures jumped Friday as Florida motorists reported fuel shortages ahead of Hurricane Irma. At least 36% of gas stations in the Miami-Fort Lauderdale area were without fuel, according to crowdsourcing platform GasBuddy. Similar number were reported in the West Palm Beach and Fort Myers-Naples regions. The shortages are the result of huge demand from residents and the aftermath of refinery disruptions caused by Hurricane Harvey. Shares in Royal Caribbean (RCL) and Carnival Cruises (CCL) have declined 5% this week as Irma battered the Caribbean. Insurers have also been hit. A massive 8.1-magnitude earthquake struck off the coast of southern Mexico early Friday morning, killing at least five people. The quake hit in the early hours of the morning when most people would have been sleeping. 2. Euro hits new high: The euro surged against the dollar on Friday to its highest level in over 32 months. The currency strengthened after the European Central Bank left interest rates unchanged on Thursday. ECB president Mario Draghi also signaled that the bank was likely to reveal its plans for scaling back its stimulus program in October. The economic outlook for the eurozone is looking brighter, but the euro's strength has been a cause for concern. 3. Huge data breach: Equifax (EFX) shares dropped more than 13% in extended trading after the company said a huge cybersecurity breach compromised the personal information of as many as 143 million Americans — almost half the country. The compromised information includes names, social security numbers, birth dates, addresses and the numbers of some driver's licenses. The breach is one of the worst in history, by its reach and by the kind of information exposed to the public. European markets opened down, while Asian markets ended their session mixed. 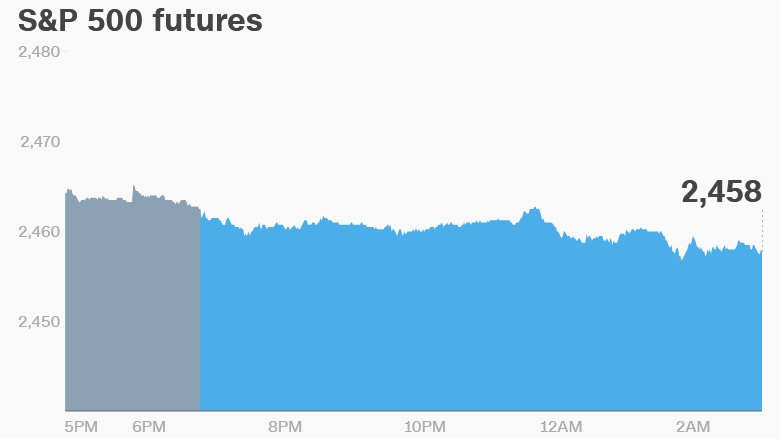 The Dow Jones industrial average and the Nasdaq both shed 0.1% on Thursday, while the S&P 500 closed flat. 5. Earnings and economics: Kroger (KR) will release its earnings before the open on Friday. The grocery chain's shares plunged in June after it warned that its earnings for the full year would be lower than Wall Street expected. That's because the competition is heating up. European supermarket chains Aldi and Lidi are planning to open up stores in the U.S., and Walmart (WMT), Costco (COST) and Amazon (AMZN) remain fierce competitors, especially since Amazon bought Whole Foods and started lowering prices. The U.S. Federal Reserve plans to release its consumer credit report for July at 3:00 p.m. ET.